We meet up with our friend Justin in Saltburn-By-The-Sea, in my personal favourite episode of Here Comes The Planet thus far! Also, if you’ve never considered taking up dinghying as a hobby, Burno makes a compelling case. Mum and I had a fantastic day in Edinburgh. 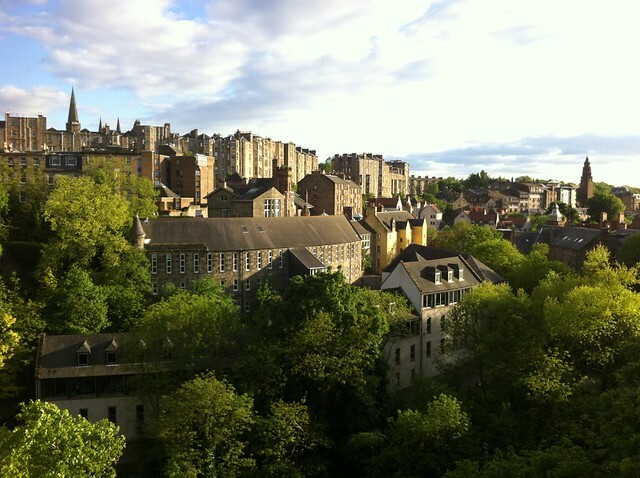 I spent a few weeks here at the very end of 1999 (god… writing a date that begins with ’19’ makes me feel like a grandma) and I remember Edinburgh fondly, albeit as a place of freezing winds and icy footpaths. We’ve had a much better time of it this trip and started the day with glorious sunshine and only a bit of a breeze. It’s funny, but I don’t feel the need to constantly comment on the weather when I’m at home. A sunny day is lovely but not unexpected. In the UK I almost feel that if I constantly praise the sun for coming out it’ll reward my attention with more of its presence. I slept in til 8:15 after a late night visiting with Nikki and Leigh and dropping my washing over to their place at about 11pm. You know people love you when they’ll wash your mother’s underpants for you rather than be at the pub with their friends (athough being at the pub with friends did happen). Mum and I had decided to go see the Queen’s yacht, Britannia, the next morning. We caught the bus down to Leith and found our way to the entrance in a shopping centre. Lining up, we were surrounded on all sides by pensioners who’d just come off a bus. The was quite a big queue but it moved quickly and we read all the displays in the entrance corridor before being passed audio guide sticks that were big enough to bludgeon a man to death with. The tour was great. Really great. The ship was fantastic, you got to go into almost all of it. The audio tour was well done and contained the kind of interesting minutae that people want to know. One example was the games the crew played. The officers had a toy wombat that had been given to them by a female staff member and they had been told to look after it. So they would throw into an overhead fan and play ‘wombat tennis’… or it might have been cricket. Either way it was funny to imagine a bunch of officers doing something Christopher Brew did in my year 7 classroom with a duster (and smashed a window). 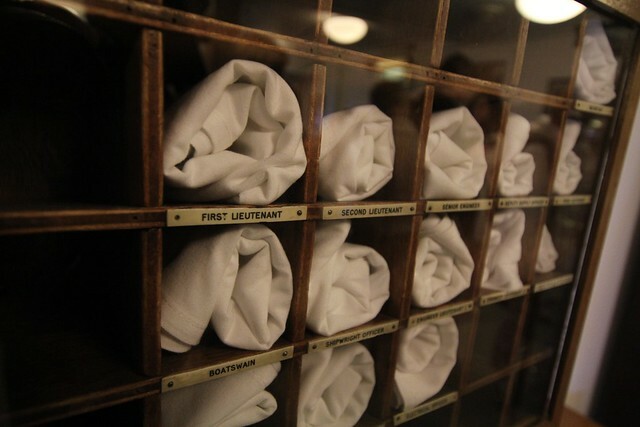 In the officers’ dining room there were pigeon holes for them to keep their napkins in. Mum said it was so they didn’t have to wash them as often. I like to think it was because they wrapped up their leftovers in them and then kept them until later. There were other interesting facts, such as learning that on state occasions the dining table (with 56 places) took 3 hours to set, that every item of silver onboard was polished every day and there was a narwhal tusk in the dining room. There were two things about the boat and its history that really stood out to me. One was the truly understated nature of the appointments. The boat was not particularly fancy in a chandeliers-and-velvet kind of way. Everything was for a purpose and the family’s sunroom had furniture that was identical in some parts to chairs we’d had in our own home. It was obviously comfortable for the royal family but in many ways it was a floating version of a beach house you’d see on any Australian coast. Cupboards of board games, a record player, nothing too fancy. In fact the Queen said of the boat that ‘It was the one place where I can truly relax’. And yet, when you looked at the details, it was a work of art. There is not a single rivet showing on the outside of the ship. It has very clean lines and the colour was chosen by the Queen She stipulated the single gold stripe around the hull. The main lounge is really quite plain but always had fresh flowers – donated by host countries, or picked from the Windsor Castle gardens when at home. The second thing about the boat was the way it was loved and cared for and the royal family were loved and cared for. It seems that anyone who worked with and for the Royals was devoted to them. 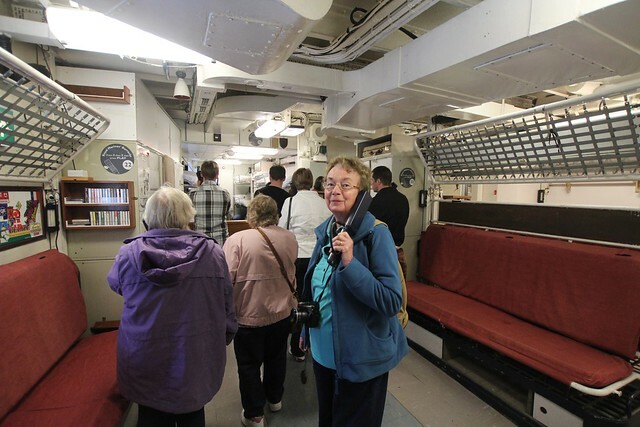 They socialised with the crew – and not just the officers – and were adored in return. There were photos of the family in the various crew mess rooms and they were often signed personally. The level of respect shown for the Queen, and the fact that this was her special retreat is nowhere more evident than in the golden rule aboard – be quiet. All commands were issued quietly, often on noticeboards or by hand signals and no one ever shouted. The ship was in immaculate condition and obviously always had been. In fact Eisennhower, when shown the shiny engine room, said something along the lines of ‘That’s a nice showroom, now show me the real thing’. Mum and I both agreed that it was a brilliant way to spend half a day and if you’re in Edinburgh spend the 12 pounds it costs and go see the ship. It’s worth it! There’s two things I have to add to today’s tale. 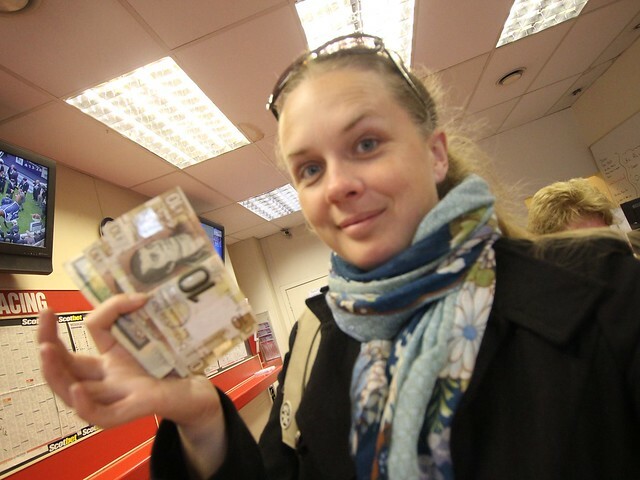 One was that, one our way back from seeing the ship, Mum spotted a betting shop (my family all love to gamble on horses… and anything else) and wanted to go in and have one bet because the Derby was being run at Epsom. We picked a horse each and put on a small sum. Unbelievably, since I rarely gamble because I always lose, I picked the winner! The odds were 1-7. Score! 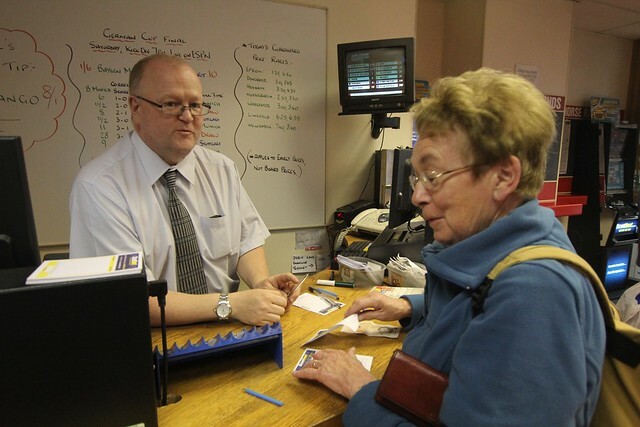 Mum tells the man “You’ll be in my daughter’s blog!” Prepare for internet fame, man-behind-the-counter! This worthy sum was used to pay for our final treat of the day, dinner with Leigh and Nikki at Kizmot Indian restaurant. 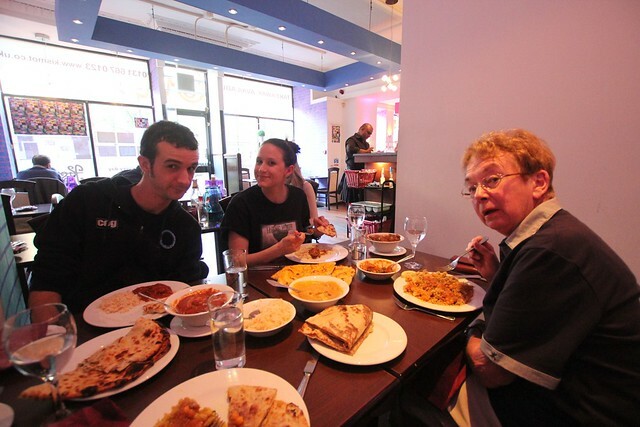 I’d found it on Tripadvisor (Edinburgh’s #1 rated restaurant, in fact) and they listed chocolate naan as a speciality. I am not one to resist the presentation of chocolate in a new and interesting manner and so I tried it and I can say it’s pretty good, especially with chicken pasanda, which is also quite sweet. Kizmot was super friendly, a little quirky and all the dishes were tasty. The ultra wide lens does weird things to my mum. I promise she isn’t really shaped like the Scottish guy in the Austin Powers movies.